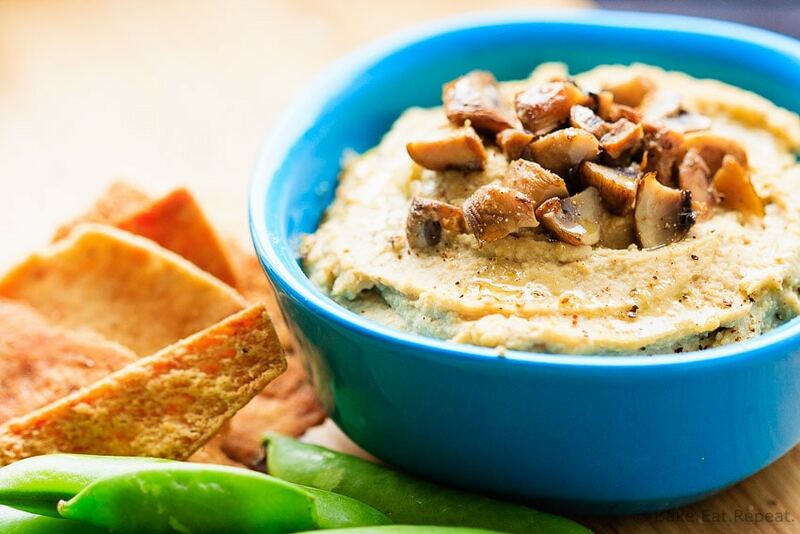 Roasted Garlic and Mushroom Hummus - Bake.Eat.Repeat. 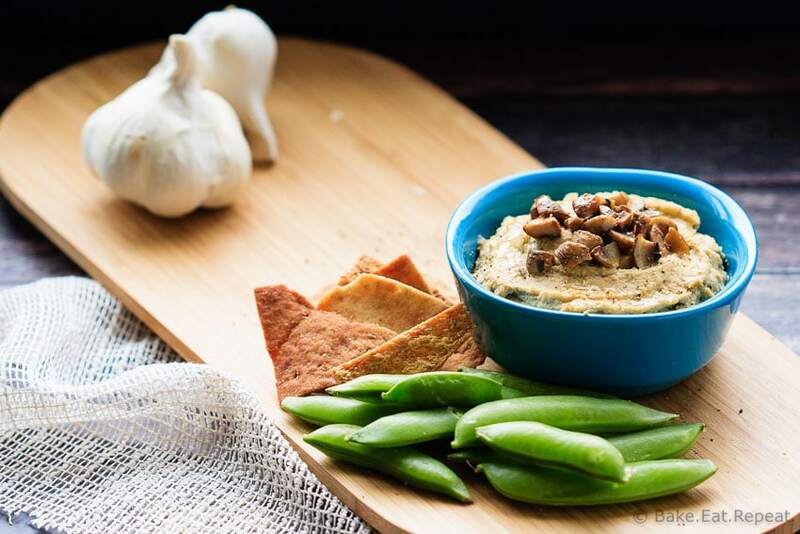 Easy to make and perfect for a snack, this roasted garlic and mushroom hummus is an amazing flavourful dip! Healthy, easy, perfect! Fun stuff today – I’m happy to be bringing you a great healthy snack recipe, as well as an opportunity to enter a great giveaway! Welcome to #EatHealthy16 where over 30 bloggers are coming together to share recipes to help you start 2016 off on the right track with food that is nutritious and delicious. Brianne of Cupcakes & Kale Chips will have healthy snacks, Jamie of Love Bakes Good Cakes will have healthy meals, and Jenny of The Melrose Family will have healthy desserts, so make sure you follow the #EatHealthy16 hashtag throughout the month of January for tons of inspiration. We are also excited to be giving all of our readers a chance to win a Blendtec 725 blender and Twister Jar, an over $750 value – just head down to the bottom of this post to enter. 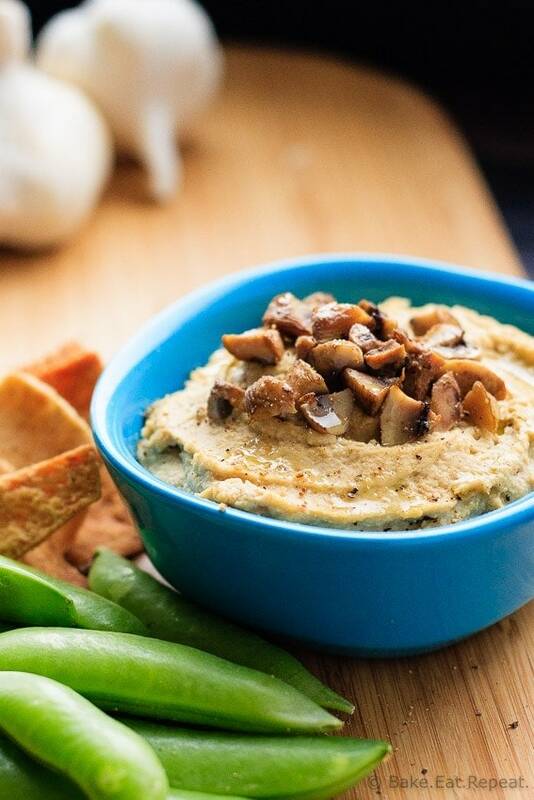 My contribution to #EatHealthy16 is a healthy snack – roasted garlic and mushroom hummus to be exact. This dip is amazing, and so full of flavour. Especially a day or two after you make it. It seems like a lot of garlic, with a full head of roasted garlic in the recipe, but don’t worry, the roasting makes the flavour much milder and it really isn’t too much. I will be adding this hummus to my growing list of dip recipes that I make over and over again because they are so tasty. That list already includes roasted red pepper hummus, this avocado hummus and this black bean hummus. All healthy snack options, all fantastic. Roasted garlic and mushroom hummus will be joining the rotation for sure. This dip is a healthy snack that has been great to have in my fridge this month, as I try to get back into the normal, healthy eating habits that always seem to disappear in December! Healthy, filling and full of flavour. I may need to make some more soon! Preheat the oven to 400 degrees F. Slice the top off the head of garlic to expose the cloves, but leave the peel intact. Place the garlic, cut side up on a foil lined baking sheet and drizzle the cloves with 1 1/2 teaspoons of olive oil. Toss the quartered mushrooms with another 1 1/2 teaspoons olive oil and spread them on the baking sheet next to the garlic. Cover it all loosely with some foil and roast for 30-35 minutes or until the garlic is soft. Remove from the oven and let cool. In a small bowl, whisk together the remaining 3 tablespoons of olive oil and the tahini. Set aside. Press the roasted garlic out of the skins (it should come out easily) and place it and the roasted mushrooms in the bowl of a food processor along with the rinsed chickpeas and salt and process until combined. Add the lemon juice and process again. Then as the food processor is running, drizzle in the tahini mixture and process until smooth and creamy. Hummus will keep well in the refrigerator in a sealed container for up to 5 days. This hummus looks fantastic and so good for you too. What a breeze it will be to make it in this blender and so much more. Thanks for the opportunity to win this. This is seriously the most gorgeous hummus, ever!! It sounds so delicious with the roasted garlic and mushrooms! I'm a little more than mildly obsessed with roasted garlic, so I am ALL OVER this recipe!! I rarely make hummus myself but this recipe can't be denied. Looks phenomenal! Oh man, I would be in BIG trouble around this hummus! It totally looks spoonworthy, Stacey! Love the sound of roasted garlic and mushrooms together in this! So I've been know to eat hummus by the spoonful, it's just SO good! But this version looks amazing, Stacey! Mushrooms and garlic are my absolute favorite, so I have no doubt that I would devour this entire batch in one sitting. Love this and can't wait to try this! I love mushrooms, and hummus is a favorite! I've never thought to combine the two -- this looks great! Love making my own hummus!! This is such a unique flavor combo! I don't think I've ever seen mushroom hummus before but it sounds amazing. Yum! !